Over the next several weeks I’ll be spotlighting the talented artisans who will offer their wares in our “Share the Harvest” Fall Gift Market on October 16. I think you’ll enjoy getting to know them and their wonderful work. 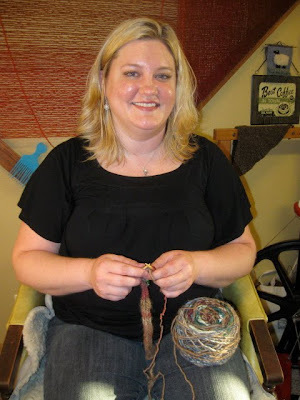 Leslie Cooper can tell you the day she fell in love with fiber – it was the first day she ever laid her eyes and hands on it: April 26, 2009. She dropped by the DFW Fiber Fest in Addison and left with a spinning wheel, fiber, and an insatiable desire to learn to spin. She taught herself to spin with books and YouTube videos, working until nearly the dawn of the next day.That’s the day her knitting needles came in the mail, and she proceeded to teach herself to knit the same way. Obsessed? We prefer to think of it as dedicated. By October of 2009, Leslie had launched her Etsy store, Spinning Spinderella, making her first sale on the day she hung out her shingle. Her second sale went to a customer in France, and she knew she was on to something. Leslie cards fiber into gorgeous art batts, and also spins and sells uniquely textured and colored yarns. Some of her customers don’t even knit, but return over and over for her lovely yarns as the end product. Leslie supports her fellow Etsy shops and buys nearly all her fiber for batt- and yarn-making from them. When Leslie thinks of spinning, she sees a young girl, freely spinning around and around. And her business name was born. Check out her neat stuff at www.spinningspinderella.etsy.com. Thanks Cindy! I had a super time knitting with you last night! Can't wait for this craft fair fun!
" . . . spinning around and around." I couldn't love any description any better. Her yarns are so spectacular, too! I'm so glad I met you, Leslie--really a sweet girl. Again, thank you, Cindy, for sharing your world! That's my baby! And just for historical purposes, at age 3, she wanted to officially make her middle name Cinderella. I'm very proud of her!